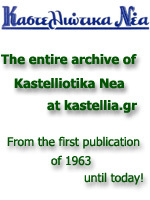 We encourage that you register to the Kastellia Portal! Through this process, we can collect valuable information for people affiliated with Kastellia worldwide, thus ensuring the quality of services offered in the "protected" registered user space. With your registration to the Portal you will gain access to the Telephone Directory as well as Business Directory services and you will be eligible to receive email @kastellia.gr for FREE. We want to reassure you that the data provided will ONLY be used by kastellia.gr for the cause of relationship building amongst Kastellia affiliated people and in no way are they going to be given out to third parties without your prior written consent. In order to assist us as much as possible, we ask that you fill out all fields (except the email, username and password fields) using CAPITAL LETTERS. (All fields marked with '*' are mandatory fields).